The Sylvania LED Roadshow at the Lutron Experience Center is Wednesday, August 31, 2011. 4:30 pm - 8:00 pm. We are hoping to get all RSVPs in today! Don't forget to register! 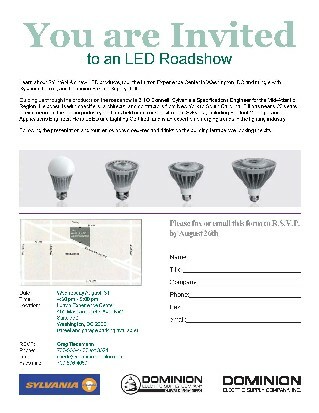 Learn about Sylvania's new LED products, tour the Lutron Experience Center in Washington, DC and mingle with industry folks. Details are on the registration form available to download at our website: www.dominionelectric.com/news.